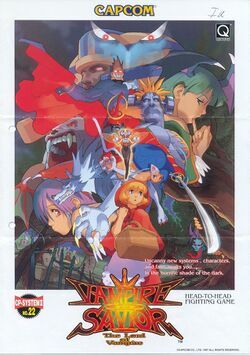 The third and final proper installment in the series, Vampire Savior: Lord of Vampire, retained the character roster of Night Warriors, omitting Donovan, Huitzil and Pyron from the lineup. Taking their place were four new characters; Jedah, Lilith, Q-Bee and B. B. Hood. Vampire Savior eschews the traditional round-based system in favour of what is dubbed Damage Gauge System; instead battles takes place during a period of one round with each fighter having two "life markers" (by default) which are diminish after one's life bar is completely emptied (similar to Killer Instinct). The player can also regain a portion of their life during battle if they avoid taking further hits. The game also introduce the Dark Force System which allow players to perform special abilities unique to each character for a limited period. In Vampire Savior, Jedah, one of the high nobles of Makai, is resurrected after a premature death long ago. Seeing the state of the demon world, he decides that the only way to save the world is to recreate it. To this end, he conjures a dimension known as Majigen, to which he summons worthy souls to feed his new world. As luck would have it, those souls belong to the characters from the first two games, in addition to three newcomers. This game was ported to the Sega Saturn and to the PlayStation (as Darkstalkers 3: Jedah's Damnation) in 1998. Both versions add the three missing characters Donovan, Huitzil and Pyron to create a full roster of 18 characters. They also provide the ability to unlock the Vampire Savior/Hunter 2 mode of play. This page was last edited on 13 April 2016, at 18:08.